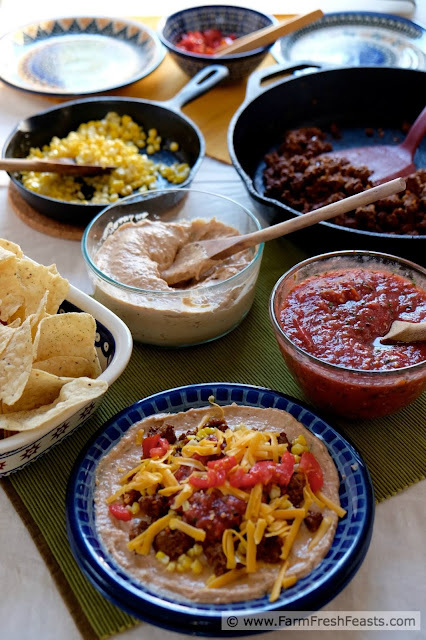 Set out skillets and bowls of your favorite fixings, along with plenty of chips, and let everyone make their own layered taco dip just the way they like. I think this time of year is an ideal time to strut your stuff. Show off what you've been up to in the kitchen, show off the fabulous job your Community Supported Agriculture (CSA) farmers or you cousin's sister's daughter* did in the farm or garden. I think a Make Your Own Layered Taco Dip Bar is an excellent way to do so. 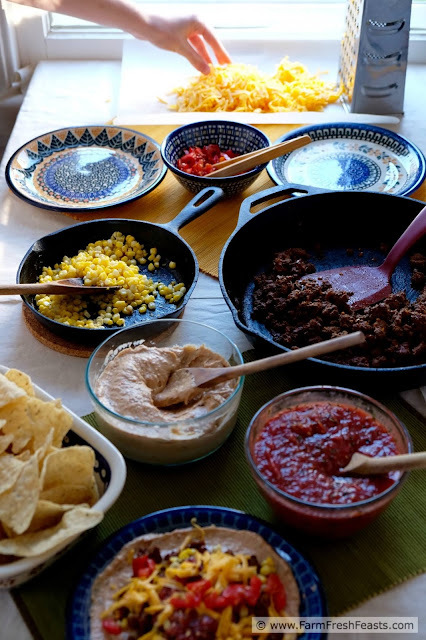 A Make Your Own Layered Taco Dip Bar works for a variety of eaters and appetites. Vegetarians and omnivores alike can heap their plates high, and if you just want a nibble of a few things you're good as well. It can be an appetizer spread or a full on meal. Most of the toppings can be prepared in advance, making this as easy as browning ground beef and whipping up a Fast & Easy 3 Ingredient Bean & Hatch Chile Dip. You can set up this concept any time of year as fresh vegetables--while delightful--are not integral to the spread. Preserved [I've put up 4 kinds of salsa so far this year] and frozen vegetables work just fine. A Superbowl party, an entertainment industry award event, basketball playoffs, the Stanley Cup . . . [do they do something for baseball?] or just because. 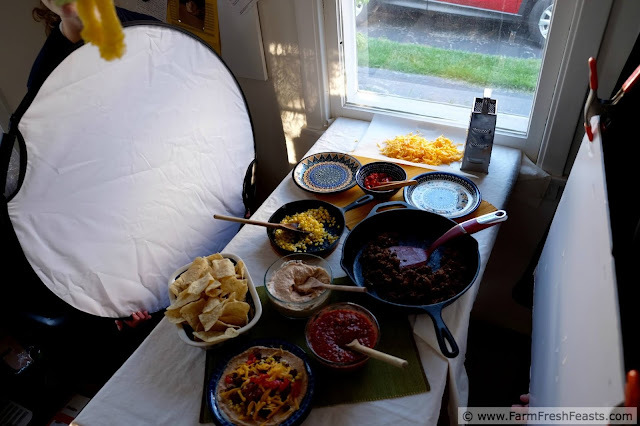 Or you could just set up a Make Your Own Layered Taco Dip Bar for a family dinner, like I've shown here. My brilliant friend Cathy, upon hearing all about the salsas I've been making, suggested I host a Salsa and Margaritas party. I love the idea! Right now is hectic--along with putting up the garden bounty as it comes in fast & furious, I'm spending my energy helping my spouse deploy. The idea of a party is a wonderful thing to clean the house for look forward to, so I've scheduled one for later this year. I'll provide the house, my Cheater Margarita Smoothies and an assortment of salsas [and dogs, I also have an assortment of dogs--but they will be out of the way with the kids]. I will invite my guests to bring their favorite margaritas, guacamole or salsa, chips, or dessert. Let me know if you host one! For more appetizers, please see my Awesome Veggie Apps and Snacks board on Pinterest. For more Layered Vegetable Appetizers, please check out my Clickable Collages of Recipe Suggestions page and scroll own past the beets. Finally, because I started this blog not to bury Caesar my recipes, I've got both a Visual Recipe Index by Ingredient and a drop down menu of ideas on the right sidebar. Want to know how to use this blog? Click here. 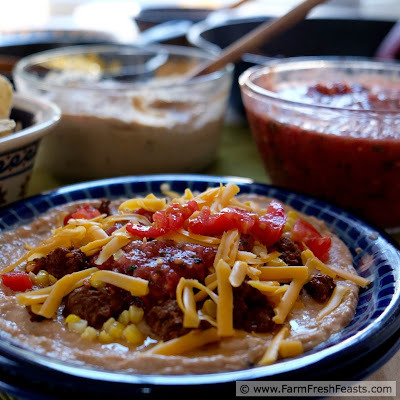 Start with a base layer, such as my Fast & Easy 3 Ingredient Hatch Chile & Bean Dip, or a bowl of salad greens, or a pot of rice. Have a variety of of toppings to scatter across the top like prepared taco meat, sautéed corn, salsas, guacamole, pico de gallo, shredded cheeses, crema or sour cream. 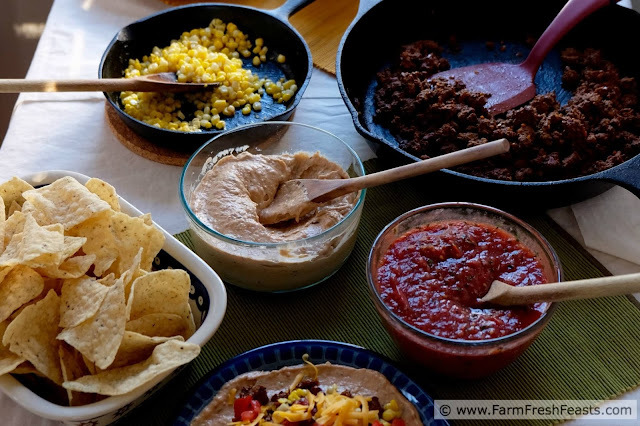 Have plenty of tortilla chips to scoop it all up with. 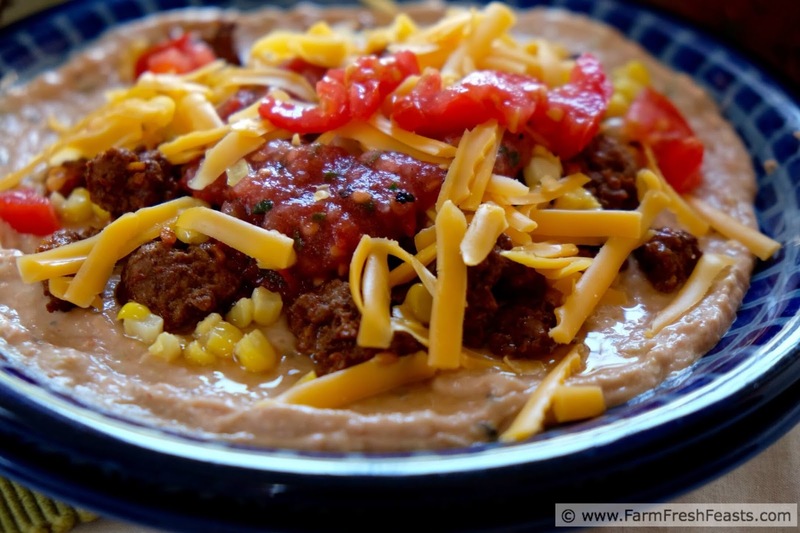 Have folks start by spreading the bean dip across the plate (or swap in greens or rice per preference). Move down the line adding toppings that suit the fancy. Dig in and enjoy! Behind the scenes--helpers holding white board and reflector on either side, and I faced my light source. I need to get all Flava Flav and hang a reflector around my neck, too. *We watched Monsters, Inc recently. It's a reference. Did I miss the party? I want to come. I'll bring margaritas. I'll drink the margaritas for you as you're harboring a fugitive! This was a huge hit at my party. I added fried beans as the bottom layer. Very yummy.